The Standard Model of particle physics is one of science's most successful theories, enabling the development of devices ranging from light bulbs, to microwave ovens and television, to quantum computing devices. The Standard Model is also one of the oddest theories, because it lays out a dizzying menagerie of hundreds of subatomic particles. At its heart are 16 types of elementary particles ... plus at least one more mysterious particle that scientists are spending billions of dollars to detect. Click on "Next" to get the full rundown. Six "flavors" of quarks have been detected: up and down, charm and strange, top and bottom. Quarks are almost always found in different combinations, bound together by gluons (more on those later). Particles built up from quarks and gluons are called hadrons. The Large Hadron Collider is so named because it's a large collider that smashes hadrons together. 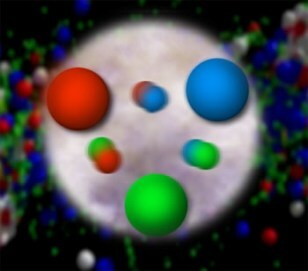 Three-quark combinations fit in the category of baryons. The best-known baryons are the proton (with two up quarks and one down quark) and the neutron (with two down quarks and one up quark). 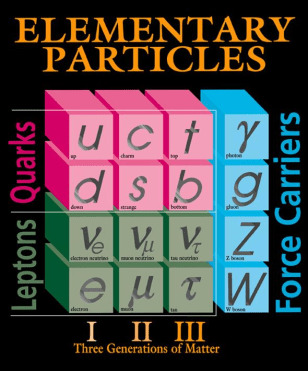 Particles that have one quark and one antiquark fit in the category of mesons. For example, the pion, or pi meson, contains an up quark and an anti-down quark. Six "flavors" of leptons have been detected: The negatively charged electron is the best-known lepton — along with its antimatter counterpart, the positron. This photo shows the path of single electrons passing through liquid helium, in an experiment devised by Brown University researchers. The muon is also negatively charged, but it's about 207 times as massive as the electron. ("Who ordered that?" physicist Isidor Rabi reportedly asked.) The negatively charged tau particle is even bigger — 3,477 times as massive as the electron — but it decays into other particles in less than a trillionth of a second. 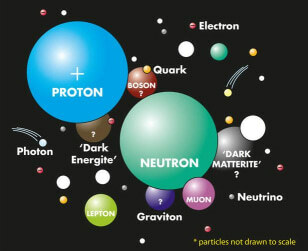 Each of those leptons has a neutrino associated with it: the electron neutrino, the muon neutrino and the tau neutrino. Neutrinos interact only weakly with other particles, and they zip through our planet virtually without a trace. Physicists only recently determined that they have mass, but there's still a great deal of mystery surrounding the ghostly particles. The Standard Model sets aside a category for particles that are associated with force fields. The effect of a field can be viewed as involving an exchange of such force-carrying particles. Four elementary force-carrying particles have been detected. The best-known force carrier is the photon — which plays a part in the electromagnetic spectrum, including visible light. The gluon binds quarks together through the strong nuclear force. The weak nuclear force involves the exchange of W and Z bosons. The W boson can carry a positive or a negative charge, while the Z boson is neutral. 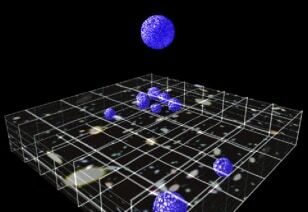 If gravity could be incorporated into the Standard Model, the force-carrying particle would be called the graviton (shown here in an artist's depiction). However, gravitons have not yet been detected, and at least for now, such particles are not accounted for in the Standard Model. All force-carrying particles are bosons, but not all bosons are force carriers. The difference has to do with a property known as particle spin. Particles with a fractional spin value (for example, electrons, protons and neutrons) are fermions. Two identical fermions cannot occupy the same quantum state. This is a property that keeps electrons from collapsing into a jumble, and thus makes chemical reactions possible. All particles with a whole-integer spin value are classified as bosons, and such particles can occupy the same quantum state even if they're identical. The photon is the best-known type of boson. Even atoms can be classified as fermions and bosons. This photo shows how atom clouds of lithium-7 (bosons) and lithium-6 (fermions) behave at low temperatures. 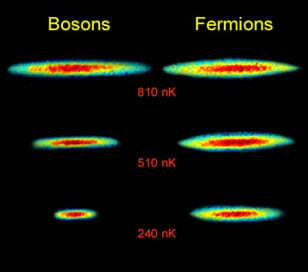 The bosons collapse into a compact cloud, while the fermions can't squeeze that closely together. The Higgs boson is the only particle predicted by the Standard Model that has not yet been detected. The Higgs is the main quarry for physicists at the Large Hadron Collider. This image is a simulation of the Higgs' signature as it might appear in one of the LHC's detectors. The Higgs boson, named after Scottish theorist Peter Higgs, is thought to be associated with a field that endows some particles (such as the weak nuclear force's W and Z bosons) with mass, while leaving the electromagnetic force's photons without mass. This Higgs field may have played a role at the very beginnings of the universe: Physicists believe that at the highest energies, the electromagnetic and weak nuclear forces were unified, but something led to "electroweak symmetry breaking" as the infant cosmos cooled. That would be why the electromagnetic force and the weak nuclear force are distinct in the current universe. 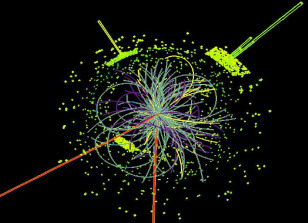 The Large Hadron Collider could shed new light on this mysterious Higgs mechanism. Hadrons and leptons? Baryons and mesons? Fermions and bosons? Sometimes it seems as if particle physicists set up these classifications just to keep outsiders totally confused. But for researchers, these occasionally overlapping categories are useful for figuring out how different types of particles interact with each other. In a sense, it's as if we've been talking about the game of chess but have gotten only to the point of naming the different pieces on the board: black pieces and white ones, pawns and knights, bishops and rooks, kings and queens. The real meaning of the game comes out when you start studying how the pieces perform and interact. To delve into the deeper meaning of the Standard Model, you can visit The Particle Adventure at Lawrence Berkeley National Laboratory, "A Subatomic Venture" at CERN, or Particle Physics UK.